As-salamu alaykum and hello everyone ♡. Yeay! 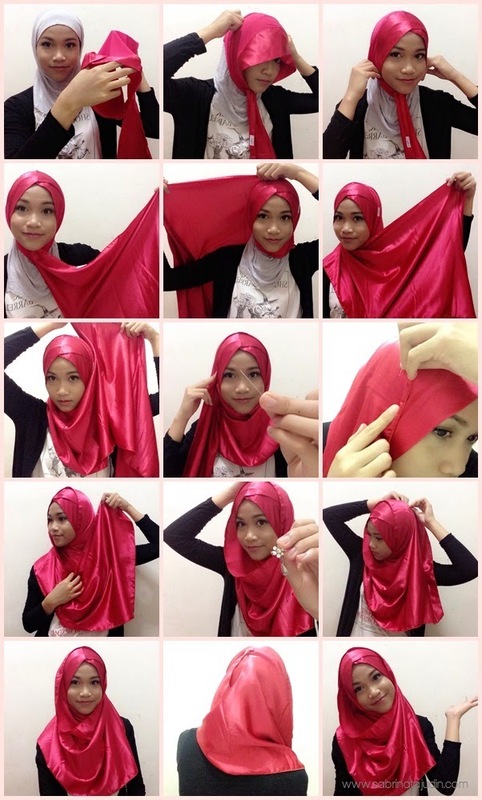 My first ever hijab pictorial featuring these satin instant scarf from Sabya Sense. Sabya Sense offers not only cool satin scarf but they also have nice cotton shawls and jubahs! I decide to make a review on these satin scarf called the Skyfall Satin Scarf. They have more than 10 colors to choose from! Right now I have 3 colors with me!. I got the Skyfall Scraf in Hot Pink, Dark Blue and Black.As you receive your package, they are nicely packed in a canvas bag and as you can see they have a "manual" haha on how to wear this instant scraft! Instan glam it is. Love how they packed these. From Left to Right : Hot Pink, Black and Dark Blue. Notice the double folded detail on the top, Now you don't need to figure out how to do this, because it is an instan scraft. Let see below on how to wear this scarf! Ignore my t shirt inside, any clue what cartoon is that? Hint : 90's - 80's kid watch this in December! Hehe. And also ignore the lines, yes I advise you to iron it first. I am just excited to put it on making this pictorial. 1. You can wear your favorite inner for the inside part. Find the "head" of the scraft. 2. Place in your head neatly according to your face shape. I have a oval face shape so the folded part does not really placed on to my forehead, but its ok. I kinda like how it turns out and make my face slimmer. LOL! 3.Now wrap it around your head securely, the scarf is pretty long, you might need a double warp. 4. Take a pin and secure it on the side of your head. Be careful! 5. Now the last wrap, adjust according to your liking. I like to cover my chest when wearing hijab and this does really cover it nicely. Love it! 6. Take a small brooch and secure pin the end on to the back of your head. 7. CHECK! and your done! I hope you love this pictorial! I love this scarf, its not see though, its comfortable and it just give you this instant glam look! Perfect for everyday and events! thank you yayangku... senang weh, instan *click* *click* glam! baa-baym! hahaha! haha nad, mmg cm ni! haha!